Students learn visually and auditorily. This lesson plan helps you to teach your students each letter of the alphabet with use of your interactive whiteboard. 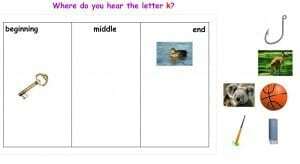 In this article we use the letter K as an example. 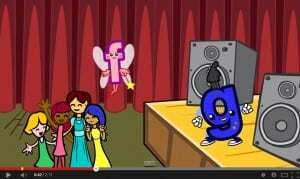 To start the lesson and to get your students engaged, start with this nice phonics song. Each day you can teach a new letter. By revealing the letter of the day, you can make use of the curtains to make it more exciting for the students. Where did your student see this letter before? Search for nice pictures that will help students recognize this specific letter visually. 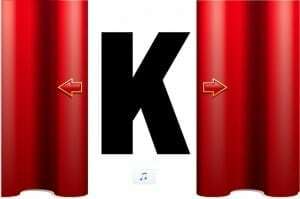 Ask some students to come to the front of the class and let them point to the K’s they see in each image. 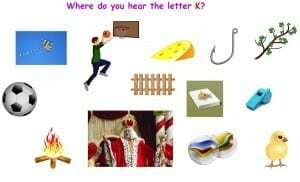 Collect around 10 images of words with a clear sound of the letter of the day. Pronounce the words clearly and let students repeat it and let them explain where they hear the letter in the word. You can repeat this exercise with the chart below. Ask some students come in front of the class and let them drag the images to the right boxes. You can continue with another visual game. Put some words on the smart board that include the letter of the day and some that do not. Let student recognize the letter of the day in the word by circling the letters. You can repeat the letters from earlier weeks and have the students try to pronounce the written words. Let your students create the letter themselves. 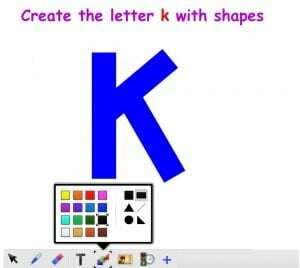 Challenge them by asking them to create the letter with the available shapes in the toolbar. You can end up each letter with a craft project. 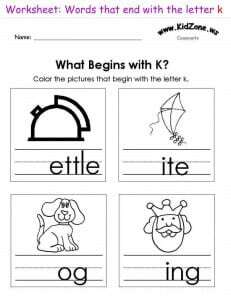 For instance this worksheet in which your students have to color the images that starts with the letter K.
As a teacher you can basically repeat this lesson plan for any letter of the alphabet. Your students will love it! You can try out this pre designed lesson via this link. Have fun teaching the alphabet!